After playing with my growing stack of blocks and browsing Pinterest and other blogsites, I have settled on the Arkansas Crossroads pattern instead for my school gift quilt. I have a perfect layout in mind that will give me just the right number of signature blocks for every child and faculty/staff member. Total number is 156, if I remember correctly. The kids are on Spring Break next week, so I’ll work to have all the blocks ready to take up to the school when they get back. I’ll also work on putting together the 16-patch blocks during the break. I am adding in some cuts from my layer cake of Prairie Gathering by Pam Buda, which really enhances the red variety with some deep saturated colors. It mixes great with the Crazy for Red collection by Minick & Simpson. I didn’t even realize I had recently seen this same pattern done up in “Halloween” colors. You can check out the latest blog entry from Ms Carrie Nelson to see a really great example. I remember reading her post and loving that quilt too! I so want to make one like it. 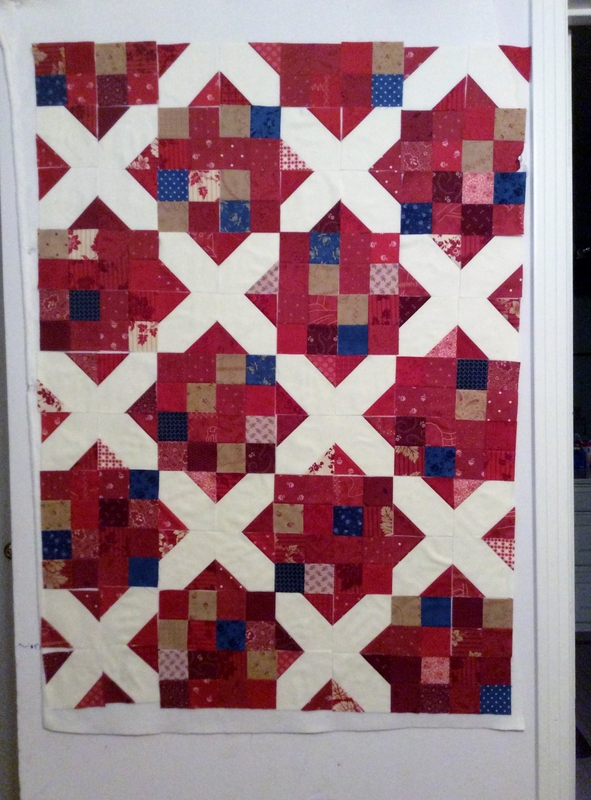 Lori Holt did a post on doing up a Scrappy Crossroads block also. Very detailed tutorial when did she a sew along back in July 2014. Check it out here. But the one that got me started down this path was a post by Cathy (aka Mrs Main Street). She does a border treatment that I plan to copy shamelessly. Take a look at her wonderful blog too! Click here to see her post about the Go Four It quilt along. I know I have seen them on other blogs, but some of them don’t have search boxes for me to look them up again. Anyway – I’m off to get home and do a little more sewing time. My layer cake of Bella Snow came in yesterday – so I should be all set now. It’s coming along beautifully, Jennifer! I really like the border idea from Quilting on Main Street.